Cabinet Specification: 2mm thick cold reduced mild steel sheet. 3mm thick anchor plates reinforce all fixing points. Fully welded construction. Anti-Jimmy folded return down the full length of the hinge side of door, this ensures the cabinet door cannot be removed even if the hinge is forced. Shelves: Five slide out internal shelves with Perspex front plate, four fixed door shelves. Lock Specification: 2 seven lever mortice locks. Hardened steel mortice bolts with anti-cutting device built into the cabinet design. Each lock is keyed different, 1500 key differs. Keys cannot be removed when the door is in the un-locked position. 2 keys provided per lock. Hinge Specification: 2mm thick mild steel continuous hinge with 25mm joints and 4.5mm dia hinge pin (hinge pin welded to hinge to prevent removal of door). Cabinet fixing: Floor fixing with 4 x 10mm dia x 75mm long hexagon head sleeve anchors (supplied). Cabinet must be fitted by a competent person. Cabinet Standards: All of our controlled drugs cabinets meet or exceed "The misuse of Drugs (safe custody) regulations 1975". 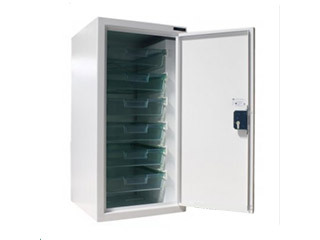 Our approved design exceeds BS2881:1989 level one, the requirement for controlled drug cabinets. Cabinet Finish: Polyester powder coated in Ral 9002 Texture.